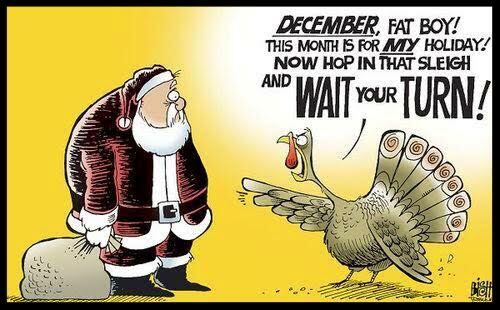 But Christmas decorations and shopping frenzies taking center stage before Thanksgiving? 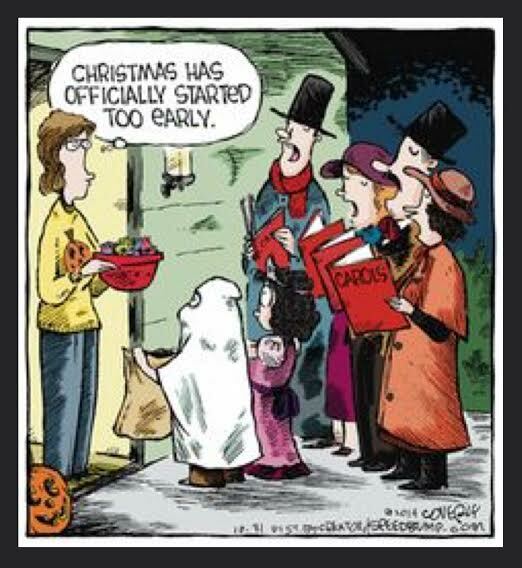 Or before even Halloween, for that matter? 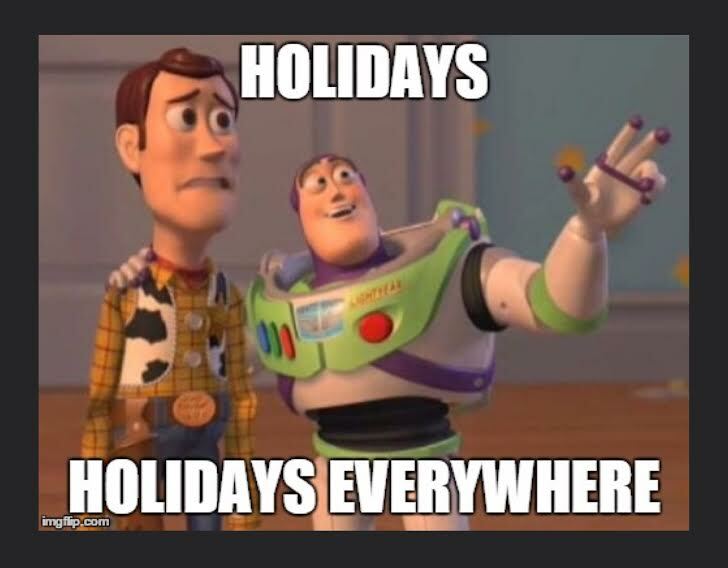 In which case, the thrill of Back to School/Halloween/Thanksgiving/Christmas/New Year all start in July. Who needs one holiday at a time? The magic of the season is undeniable. Or even putting up the Christmas tree. The insanity of the season can wait. Right now, I’m perfectly content with relishing the delightful crackle of vibrant autumn leaves beneath my feet on a crisp November morning. Unless, of course, I’m somehow magically gifted with a one way ticket to a remote tropical island. One celebration at a time! Enjoy! 😝enjoy the craziness anyway. You will have to wait till next July to get into this celebration frenzy once again! I’m with you on this one Angelica. 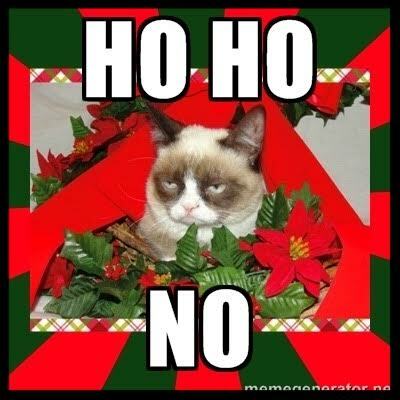 It wasn’t even Halloween and the malls here where I live had their Christmas decorations kiosks up already. 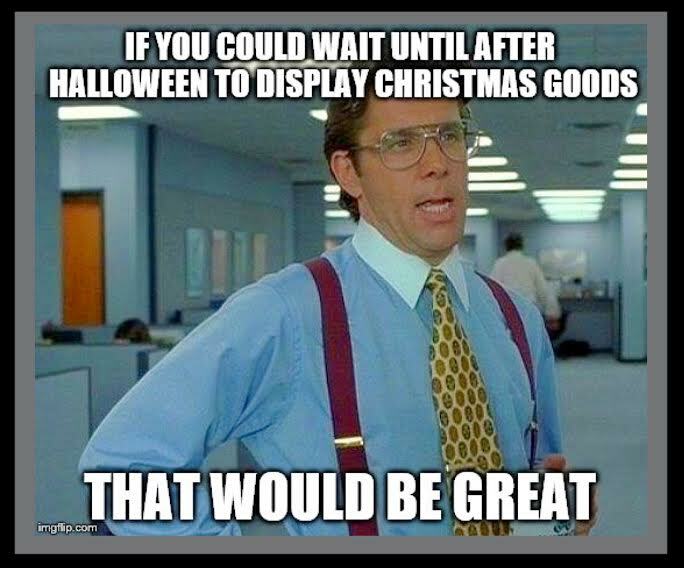 Like the many mall patrons, I was completely flabbergasted at how they were trying to get the jump on Christmas…but really, before Halloween. 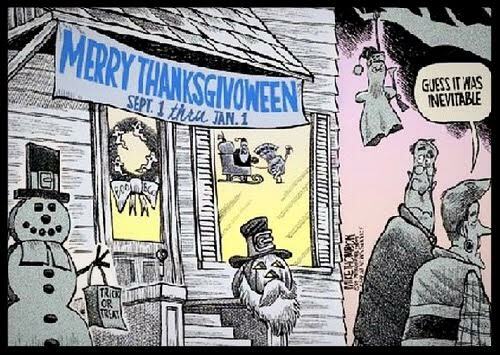 What next, Christmas things popping up the day after Labor Day? 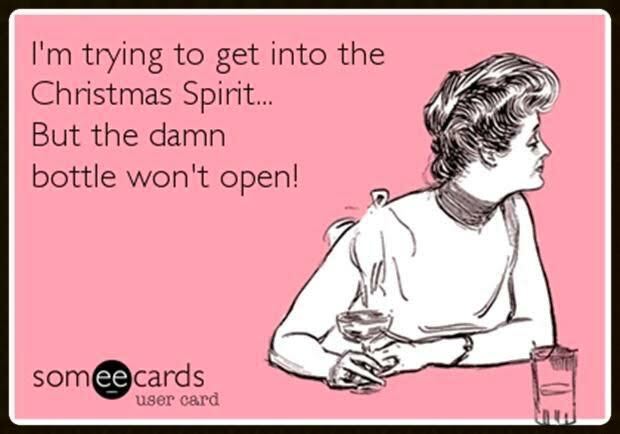 But bring on the holiday season, I’m ready for it. I’m smiling & nodding “yes”, in fact, just this week, the Grinch movie was on TV way before November 11th! I’ve stopped celebrating the madness of Christmas, instead, I focus on the natural rhythms of the season – lighting candles, decorating with found objects (pinecones, shells, etc.) and enjoying the treats that abound at this time of year! Lately, I try to include a handmade gift amid the odd gifts I pick up from my favourite local stores…it takes practice not to succumb to the glitz and glitter (though I still sprinkle a wee bit of the stuff throughout the apartment!)! I wish you well when you’re ready to jump right in (perhaps there’ll be another Walmart post in the works!)! 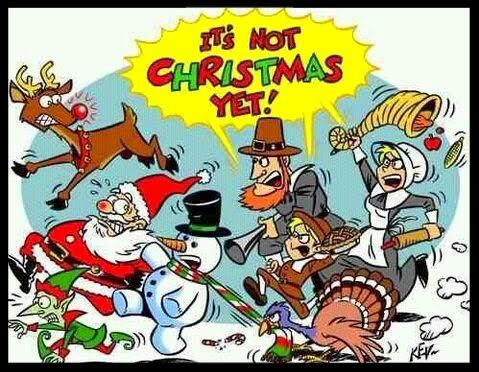 It’s insane, it bugs be a lot, I refuse to even consider thinking about Christmas till the first week of December. 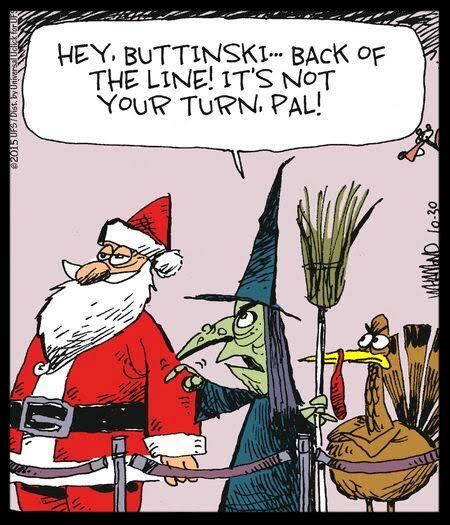 Merry Thanksgivoween! I think I’ll borrow that one. 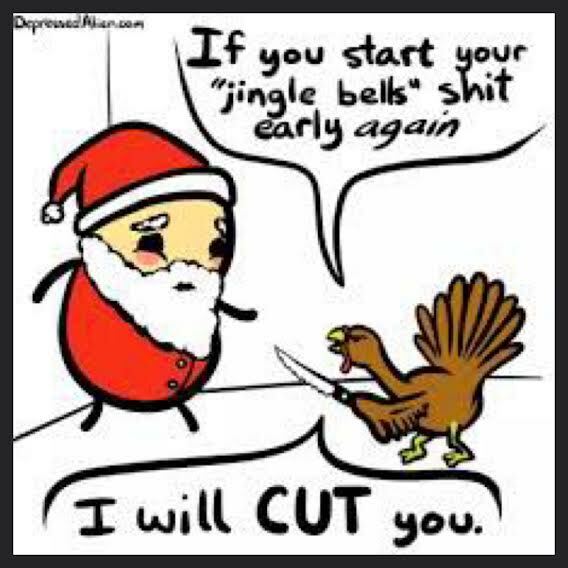 😆 I was just bombarded with Christmas commercials, too…on Veterans’ Day. The material madness for all holidays has gotten out of hand. 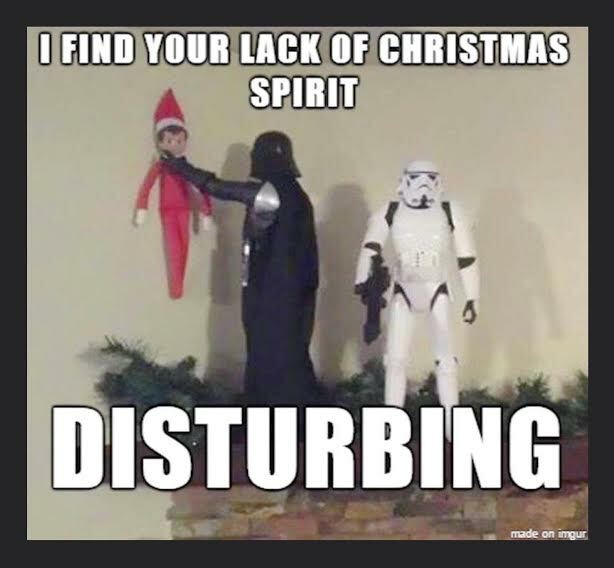 I think “the spirit of the season” has come to take on a much different meaning than originally intended. Yeesh. You know you’ve spent a LONG time working retail when you find posts like this to be a little weird. 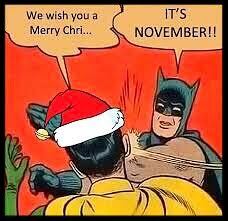 I’m like… come on, everyone should know by now the Christmas season starts at midnight Halloween night! 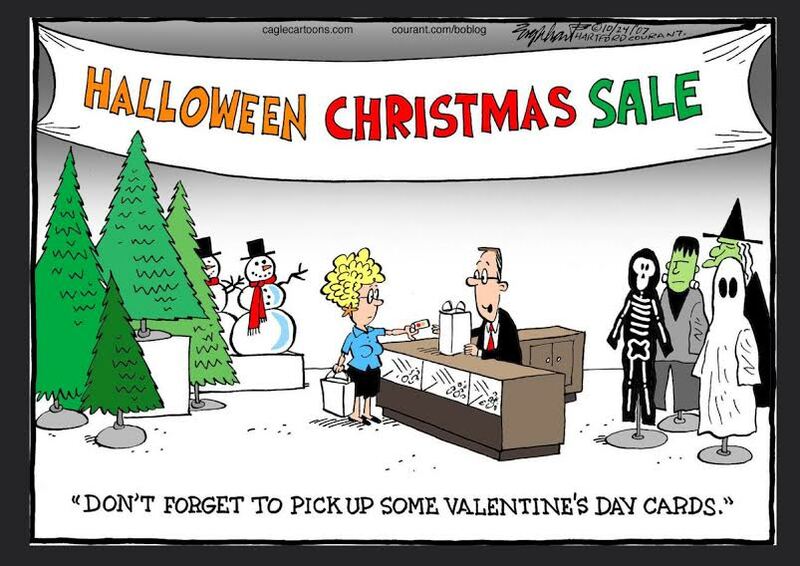 And forget that October early sales holiday stuff…. that’s like baseball’s Spring Training! February baseball is just as weird as October Christmas. I do wonder where it all began, though, and I can only think it was when retailers noticed all those way-too-efficient people who were checking off their Christmas shopping lists long before the first cold snap hit. 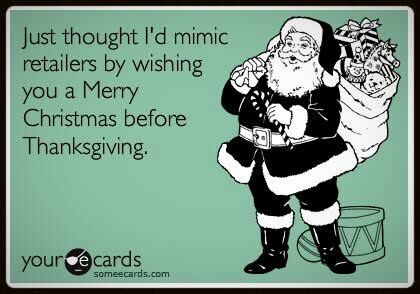 Why anyone would want to decorate for Christmas before December does still puzzle me…. but Christmas shopping is practically a year round activity for a lot of people. Hopefully the Easter Bunny won’t get too upset if he has to hide eggs under the tree one year…. Perhaps this is a result of the American concept of ‘one-stop shopping’? Seriously, tho, we’ve lived in the South for 5 years and here, where it is hot, they start selling ‘fresh cut trees’ in early November. The stand on the main road a few blocks from where we live had the sign up for 2 weeks announcing ‘x-mas trees in on Nov. 14th’ and the lot has all the stands ready for the display. Many trees are up and displayed in homes for all to see a full week before Thanksgiving. Now what gets me is not so much the timing of trees to be bought and the fact that if you don’t get one till after Thanksgiving, it’s ‘sorry out of luck’…but the fact that who in the hark-the-herald-angels-sing heavens wants a crispy christmas tree on christmas?!!! Oh I forgot, this is the South, where everything is deep fried, and crispy-creamed. BTW: love the pics with Santa hogging (!) his way in front of Tom Turkey. Especially with your pooch looking for a stick to offer up to his master to throw – just grab those perfectly dried sticks hanging about in the living room – artificial does double duty in keeping doggie ‘good’!!! My sentiment indeed. One reason to celebrate one season at a time.